A Yemini prisoner and a member of the Baha’i community has been sentenced to be executed in public because he made contact with Baha’i headquarters in Haifa. The Executive Council of Australian Jewry (ECAJ) joins with the Baha’i community in calling upon the Iran-aligned Houthi authorities in North Yemen to quash the death sentence against 52-year-old Yemeni prisoner of conscience Hamid Kamal Muhammad bin Haydara, to release him from prison immediately and unconditionally, and to cease their persecution of other members of the Baha’i community in the areas under their control. 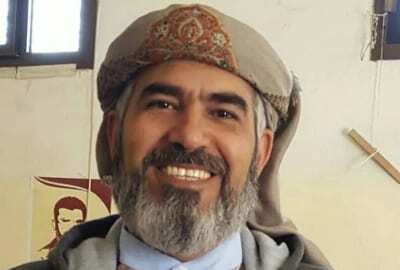 Hamid Haydara, has been detained in Sana’a since December 2013. Six other members of the Baha’i community in Yemen are currently imprisoned. Mr Haydara’s alleged crime has been to contact senior administrators of his own religious community, because they happen to be located in Haifa in Israel, which has been the centre of the Baha’i faith since it was founded in the nineteenth century, long before the establishment of the State of Israel. “We have been appalled at the trumped up nature of the charges against Hamid bin Haydara, the barbarity of the public execution to which he has been sentenced and the treatment meted out to him according to reports by human rights organisations”, said Anton Block, President of the ECAJ. “It is bizarre that the judge who has sentenced Mr Haydara to death by public execution told the prosecution several times during the trial that no substantive evidence had been presented against him”, Mr Block said. The court also ordered confiscation of Mr Haydara’s assets and the dissolution of elected Baha’i councils that look after the spiritual and material needs of the community. This mirrors acts of persecution against the Baha’i in Iran during the 1980s. “This case is a shocking example of the extremes to which the Iranian regime and its proxies are prepared to go to carry out the religious persecution of the peaceful and apolitical Baha’i community,” Mr Block concluded. “We are reminded of our obligation to seek the freedom of the innocent, “to bring out the prisoners from the prison, and those who sit in darkness out of the prison-house” (Isaiah 42:7).